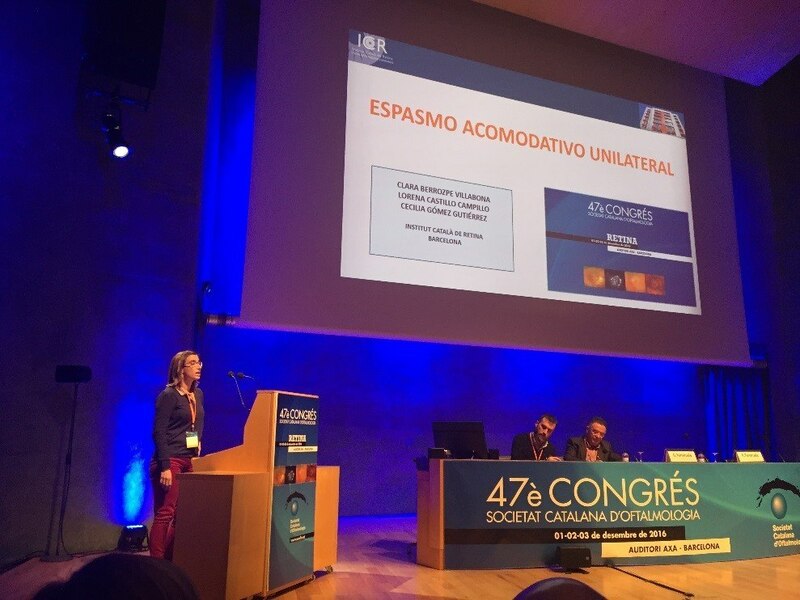 The 47th Congress of Catalan Society of Ophthalmology was held on December 1st, 2nd and 3rd. ICR ophthalmologists took part very actively in the congress, with a series of presentations, communications, posters, videos and symposia. The most prominent communication was the video presented by Dr Rey on intraoperative optical coherence tomography, that was awarded the prize to the best video communication. 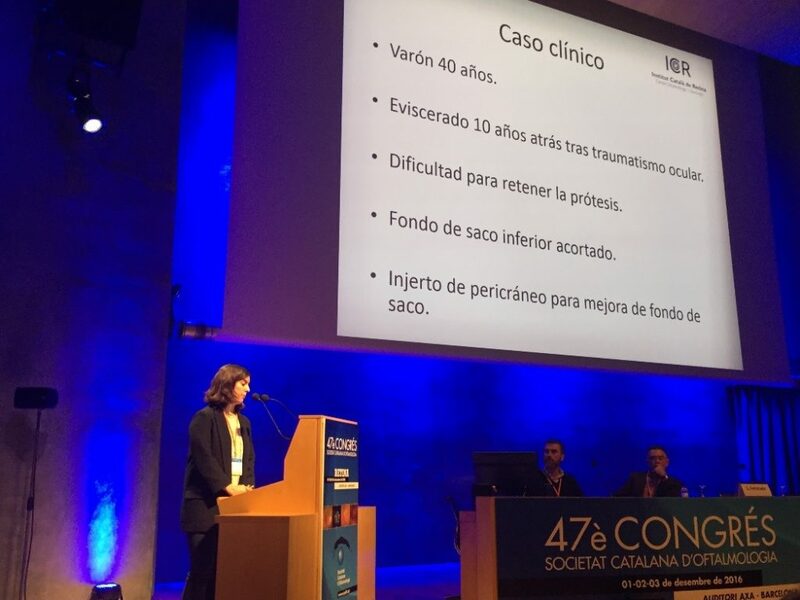 Dr Pilar Cifuentes presented another video communication created by her and Dr Núria Ibáñez on the surgical extraction and pericranium graft implant technique for the reconstruction of anophthalmic cavities, a technique whose use in ophthalmology has been pioneered by Dr Ibáñez. Dr Pilar Cifuentes presenting the video “Pericranium graft for fornix reconstruction in ophthalmic cavities”. At ICR we have been performing this surgery for over 5 years now with excellent results, as proven by the study “Pericranium Grafts for Exposed Orbital Implants: An Observational Case-Series Study”, published by Dr Ibáñez in the international “Journal of Cranio-Maxillo-Facial Surgery”. As for Neuro-ophthalmology, Dr Berrozpe presented a video communication prepared alongside doctors Lorena Castillo and Cecilia Gómez from Neuro-ophthalmology Department on a clinical case of unilateral accommodative spasm, a syndrome characterized by three clinical signs: myosis (small pupil), esotropia (eye deviation to the nose area) and pseudomyopia (refractive error). It is usually a condition that appears on both eyes, with a functional aetiology that may cause symptoms such as a decrease in vision and double vision, among others. Unilateral form of this spasm, which was the case presented, is an exceptional form of the disease: only 4 articles describing similar cases have been published in scientific literature. Dr Jürgens, medical director at ICR, taking part in the round table of surgical retina with his presentation. 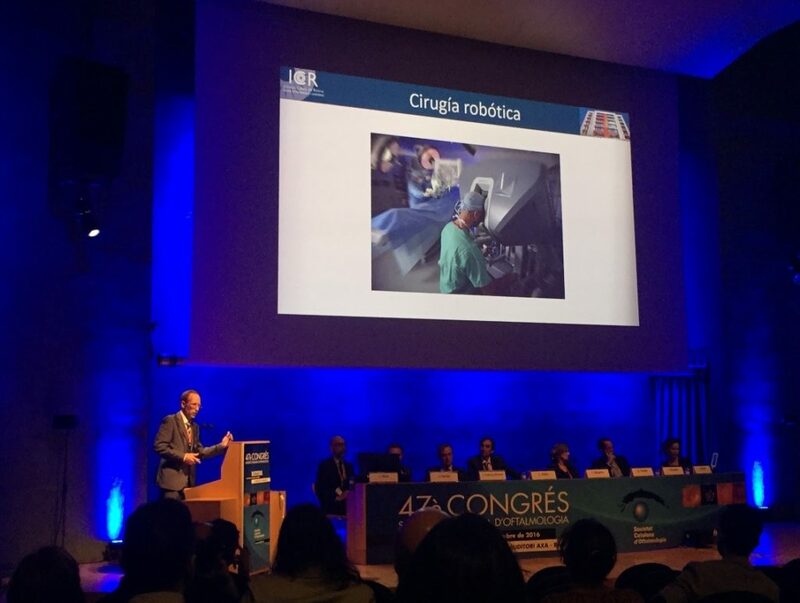 In terms of congress round tables, Dr Jürgens, medical director at ICR, presented Computer-assisted ophthalmic surgery: welcome to the future, in the round table on surgical retina, where he presented new computer-assisted technologies applied to surgery. Dr Jürgens talking about robotic surgery. 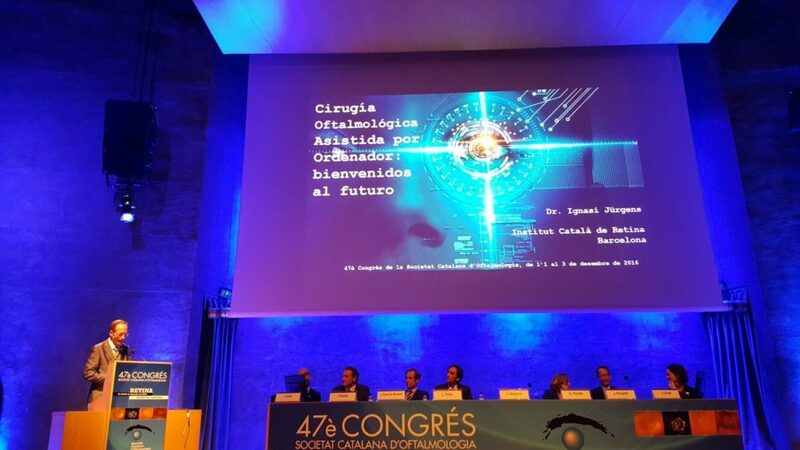 Dr Maseras, ophthalmologist from Retina Department at Institut Català de Retina, also took part in the last round table on retinal clinical cases. Dr Maseras in the round table on retinal clinical cases. The first one will be presented by Dr Berrozpe, under the name Atypical optic neuritis by Epstein Barr Virus (EBV), that analysed two clinical cases of EBV optic papillitis. Moreover, Dr Cecilia Gómez, from Neuro-Ophthalmology Department, carried out two presentations. The first one, under the name When low visual acuity in a child is not due to a refraction error, analysed a case of dominant optic atrophy (ADOA), a hereditary optic neuropathy that must be taken into account in cases of children with low visual acuity when there is bilateral and symmetrical papillary paleness in the eye fundus, as it is the most frequent optic neuropathy. The second one analysed the case of a patient suffering from a carotid-cavernous fistula whose interest lied in the fact that, despite having the latest-generation tests, it was the clinical criterion and the gold standard test that helped reach a diagnosis. With regard to the Retina Department, Dr Agnieszka Dyrda presented Occult macular dystrophy: clinical, functional and morphological findings, which revolved on the usefulness of multifocal electroretinography and SD-OCT in the detection of this very infrequent and difficult-to-diagnose disease by means of presenting two cases treated in our centre.